This tutorial will guide you through the process of writing a program for the OS. You will need a suitable 64-bit UNIX development environment, such as Arch Linux. Then start the build system. Following on the on-screen instructions to build a cross-compiler. The build system will exit when it's done. It'll take approximately 20 minutes on a decent computer. Then, making sure Qemu is installed, run the build system again, and try a test build on Qemu. If you have problems, complain in #essence on the Handmade Network Discord. 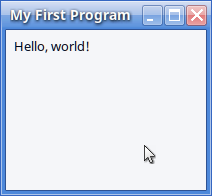 Then, in a text editor, create the file my_first_program/my_first_program.manifest. Restart the build system. It will automatically detect your new program. 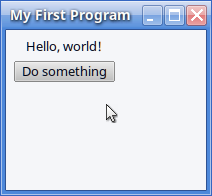 Run the build system command first-program, and set it to My First Program. Then test the OS using the command t2. In Qemu, switch to the serial output view (View->serial0; Ctrl+Alt+3). You should see your message, "Hello, world! ", at the bottom of the output log. Before we can create a window, we need to make an instance. Because our program will handle multiple instances in one process, we need to keep track of each instance separately. So let's make an Instance structure. When we receive the OS_MESSAGE_CREATE_INSTANCE system message, we should allocate an instance, and create the corresponding API object. We can now create a window! Then in the source file, create the window, a container grid, and add a label to it. Build the OS (t2), and you should be presented with a window. Before we can make a button, we have to define the command template for the operation it will perform. In a user interface, it's common to have multiple controls that invoke the same command (e.g. a menu item and a toolbar button), so the command system helps to coordinate all that. The command template will be added to the osDefaultCommandGroup. When a new instance of a program created, we need to create this command group, and attach it to our instance object. The command group is just an array of commands. The name of the command template myFirstCommand can be used as an offset into this array. So we'd write commandGroup + myFirstCommand. Now, let's increase the size of the container grid so there's room for a button. Then we can finally add the button, which will inherit the label of the command's template. When the button is clicked, it will invoke the command to which it is attached - commandGroup[myFirstCommand]- by sending a OS_NOTIFICATION_COMMAND notification to its notification callback. We will need to make the function ProcessCommandNotification. OSCommandGroupSetNotificationCallback will make the notification->context field equal to the offset of the command into the group. Also, by passing our instance structure into OSInstanceCreate, notification->instanceContext will be equal to that instance structure. // The button (or any control attached to this command) has been clicked. When we get the notification, let's change the label's text. We stored the label in our instance structure. 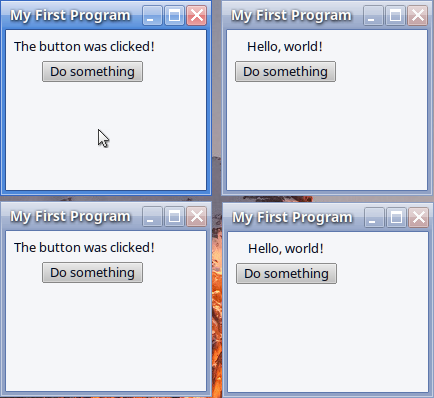 Using this setup, if the user opens our program multiple times, the button in each window should modify the correct label. Note: window closing and instance destruction isn't fully implemented yet. When the window is closed, a OS_NOTIFICATION_WINDOW_CLOSE notification is sent to the window. When this happens, we can destroy the instance object we created, and deallocate the Instance structure. First, let's set the window's notification callback. We the destroy the command group (don't forget to add this to your Instance structure! ), destroy the instance, then deallocate the instance. ...to your manifest, below the [build] line.